Sowwah Island, a 105 hectare development situated between Abu Dhabi Island, Al Reem Island and Mina Zayed, is quickly taking shape to become the country’s new Central Business and Financial District. This massive project, designed to accommodate a 75,000 strong workforce and house 30,000 residents, is currently well into construction of Phase 1. It includes the prime part of the island, namely the completion of 4 out of 13 bridges, utilities, a tow-tier road network, pedestrian passageways and an extensive sea wall. 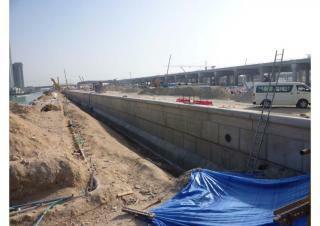 RADCON Formula #7 lifetime waterproofing and protection technology was used on this 4.5 km long sea wall surrounding the island. RADCON is ideal for marine environments as its key benefits include 89% chloride ions ingress reduction.